A bunch of dedicated Master Gardener volunteers were out in the nippy Tuesday morning air still clipping away old growth and getting the flower beds ready for the new growth. 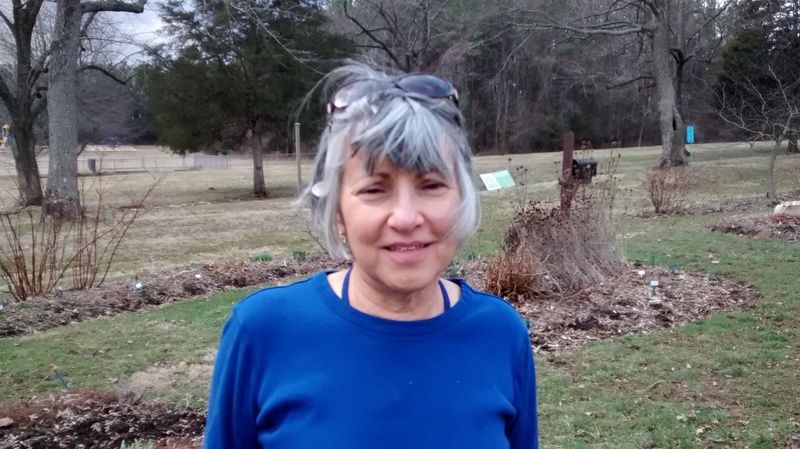 Leslie, Master Gardener volunteer, remarked that the daffodils in the Deer Resistant Garden now have buds (last week they didn’t) and she predicts they will be in bloom by the end of this week. Let’s hope she’s right. The organic Cooks’ Garden volunteers were busy planting cabbage and broccoli plants. Seeds of Black Seeded Simpson lettuce and French Breakfast radishes were sown around the broccoli plants. Six rows of potatoes were planted. The various varieties will be harvested throughout the season: Cobbler (early), Kennebec (mid-season) and Russet (late season). First day in the garden. Yesterday was a beautiful, sunny day for the first workday for Master Gardeners in the Teaching Garden. The luck of the Irish must have shined down upon us! There were about 30 people tending to the various flower beds and vegetable garden. We even had our first school group visit of eleven children from Linton Hall School Little Sprouts pre-school, Bear class. They carried magnifying glasses to see all the new growth sprouting. Leslie, a Master Gardener Volunteer who coordinates the work at the Teaching Garden, was busy checking up with other Master Gardener Volunteers and seeing what needs to be done. Leslie, oversees the Teaching Garden. Ruth, in charge of the Fragrance Garden, was removing branches from the rose bush that were rubbing other branches. She said if branches rub together, there is a chance for a wound which means insects and disease can get in – best to eliminate the potential problem. Ground ivy was about the only green plant (weed) growing which she dug out. Ruth says the other hat she wears is as the “Deer Police.” She had a mix of Bobbex ready to spray on plants that deer like to nibble. Bobbex is an organic mix made out of putrescent eggs, etc. to discourage deer. She sprays deer favorites like day lilies, hostas, and hydrangeas. If the deer manage to eat the plant’s roots, the plant is lost. She also uses peony rings to hover above the plant roots to discourage nibbling. Small trees will be sprayed because deer like to rub their antlers on them which can harm the bark and invite insects and disease. The organic Cooks’ Garden looks wonderful. Amye and a team of Master Gardeners turned over the cover crop and added compost. A trellis was put in place where they planted sugar snap peas and English shelling peas. In between these two peas, parsnip seeds were planted. Brussel sprouts and cabbage were allowed to overwinter and those were removed except one that will remain as a “trap crop” for pests this season. A trap crop is a plant that attracts pests, usually insects, away from nearby crops. This form of companion planting can save the main crop from decimation by pests without the use of pesticides. The Brussel sprouts were offered to people and they tasted delicious! Want to read “Organic Gardening” magazine for free online? Did you know you can get current, popular magazines, like Organic Gardening, downloaded to your computer or device through the public library? Prince William County Public Library System (PWPLS) offers Downloadable Magazines to patrons through Zinio. These are full digital versions of the print edition, available free to library patrons with no waiting and no checkout periods. Create a Library Zinio Account using your library card number. Select whichever magazines you want from the library collection. If you chose, you can download a free Zinio Reader App. To select new titles, Return to your Library Zinio Account. Twelve days till spring! Thinking about what plants you want to plant in your garden? This is the time to start planning. See LINKS tab for help and information. Master Gardeners will be at the Teaching Garden starting Tuesday, March 17 from 9 – noon. Time to get the garden ready!